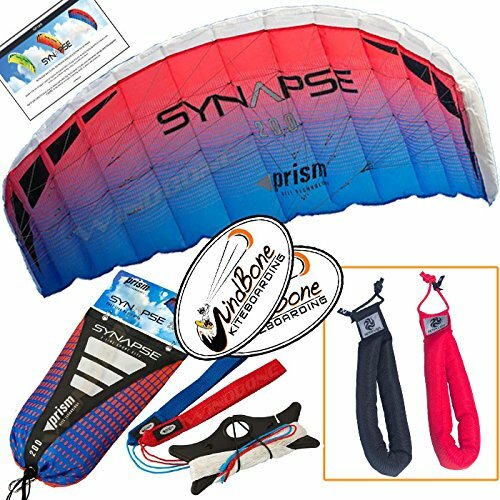 Prism Synapse 200 Coho Kite Blue Red Bundle (3 Items) Dual Line Power Foil Parafoil + Peter Lynn Heavy Duty Padded Kite Control Strap Handles Pair + WindBone Kiteboarding Lifestyle Stickers by Prism Power Kites, Peter Lynn, WindBone at Scruffs Game. MPN: PRSYN20PLSTRP, WBKLSTK32. Hurry! Limited time offer. Offer valid only while supplies last. Prism Synapse 200: Power Foil 2-Line Kite - Speedy and agile, the Synapse rips through the sky wherever you go - smooth and precise with solid pull. Prism Synapse 200: Power Foil 2-Line Kite - Speedy and agile, the Synapse rips through the sky wherever you go - smooth and precise with solid pull. Guaranteed to thrill, the Synapse series is all about speed and agility. Perfect for beginners to experienced pilots alike, the Synapse comes ready to fly and stuffs into a compact pouch to take with you anywhere. Their high-aspect wings steer like sports cars with fingertip accuracy for experienced pilots yet stable and forgiving for new pilots. The all fabric design means no frame parts to damage and no assembly required. Choose from three sizes- the bigger you get, the more you'll feel the power of the wind. Synapse Kite comes Complete & ready to fly with lines on winder, standard wrist straps, instructions, and carry bag. WindBone Kiteboarding Lifestlye Decals: Add some WBK style to rear car windows and let everyone know you're a kiteboarder / power kiter.. If you have any questions about this product by Prism Power Kites, Peter Lynn, WindBone, contact us by completing and submitting the form below. If you are looking for a specif part number, please include it with your message.